Fighting fire with . . . goats? Yep, that’s what’s happening in southern Portugal. More than 200 brown-and-white, low-tech lawnmowers are munching their way through thick undergrowth—and making a difference in a country plagued by raging summer wildfires. God made goats to be curious, agile, and intelligent. They’re also eating machines. But contrary to popular opinion, goats won’t gobble just anything. For example, they won’t eat tin cans, cardboard, or clothing—even if they will sniff and taste test. 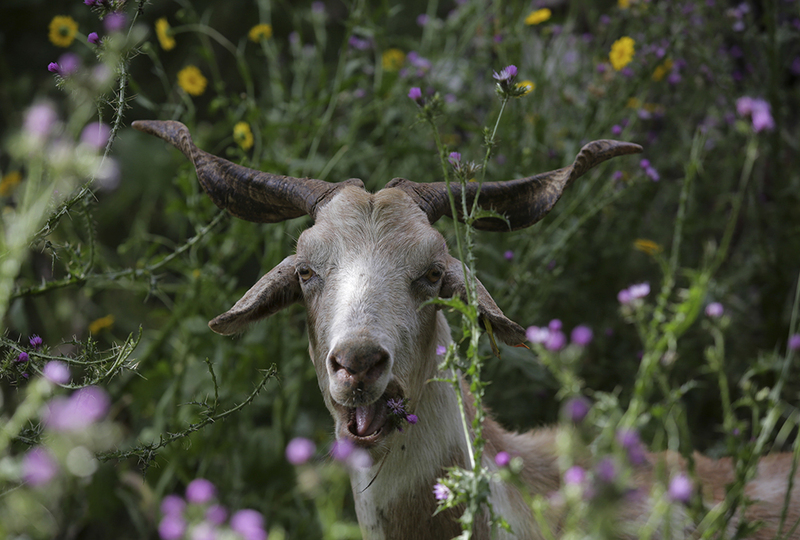 But goats will munch vegetation that other animals won’t—thorny vines, poison oak, and prickly weeds. 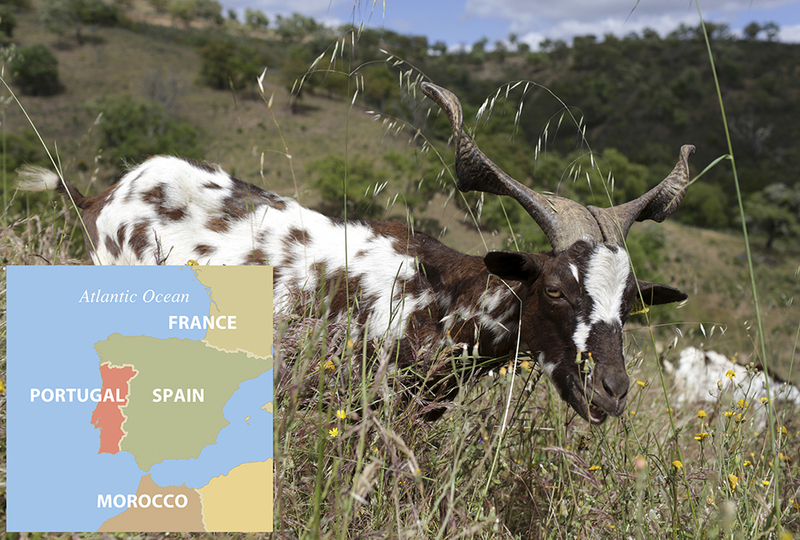 For hundreds of years, goats have cleared land for humans. 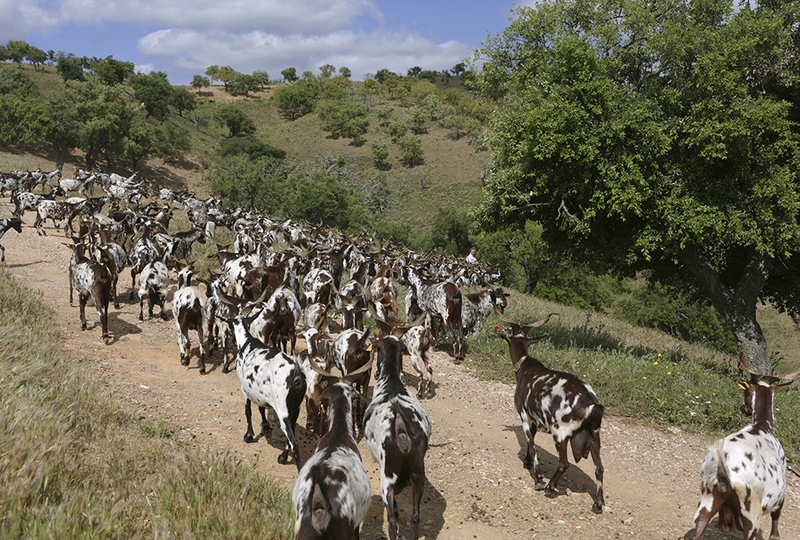 This summer, Portugal’s government employed dozens of goat herds. These environmentally friendly hired “hands” will help clear unwanted scrub from Portugal’s densely wooded areas. Government officials hope the goat patrol will guard against disastrous wildfires, which spread quickly through untamed underbrush. Fire prevention in Portugal is a mammoth task. Fanned by the summer “Nortada”—north wind—abundant, waist-high brush fuels wildfires. Every year, blazes blacken large areas of forest. Last year was the deadliest fire season on record. Officials have tried warning systems, water-dumping planes, and escape routes. Goats work best. There’s a reason Portugal’s brush is out of control. Many folks have traded rural life for the big city. 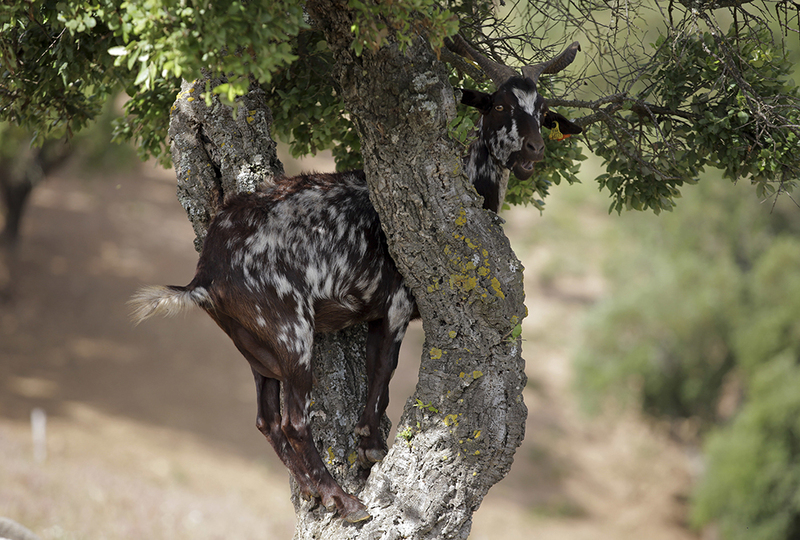 Today’s forests are inhabited mostly by elderly people who don’t keep goats. Grasses, weeds, vines, and shrubs grow unpruned. “There used to be lots of herds around here,” says 61-year-old goatherd Daniel Fernandes, leaning on his walking stick. Many of the forest trees are fast-growing eucalyptus. Portugal’s paper business pays well for its lumber. But eucalyptus is an oily wood. It burns like a fire torch. The government wants to encourage planting species more resistant to flames. But without young farmers to plant and care for the trees, the effort seems futile. Fernandes and his wife Anita are the only two left in the hamlet of Moita da Guerra, 150 miles south of Portugal’s capital of Lisbon. They recall a major blaze in 2004. Their goats had eaten and trampled down the undergrowth that surrounded their home. The goat-buzzed ground starved the flames. In God’s providence, the fire eventually leapt over them and kept going. 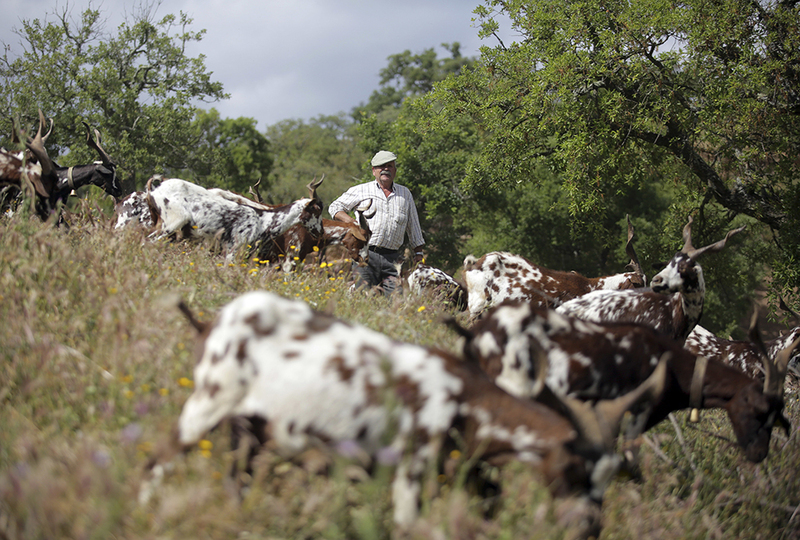 This year, the Portuguese government hired Fernandes’ herd. The goats carved out firebreaks in the southern part of the country ahead of the hot days of summer. But experts warn it will likely take years to correct the trends that make the country especially vulnerable. We need our neighbors' goats to come over more often! I never knew that goats could be so helpful! have you heard about goat polo? I just read an article on here about it. Interesting. well this is odd i need a goat to eat weeds in our backyard i want a fainting goat look it up its so funny! We have goats and LOVE them! I find it amazing that goats are able to "fight fire". goats are the best things that Allah has ever created! Yay! They are finding more uses for animals! This could help in other future problems! Also, that would be a pretty good job to give your goats to someone else just for a little bit. i think that is very good for the environment cause the world shouldn't die from wild fires. i think that people should breed goats and sell them to more goat watchers so that over time there will be NO wild fires!! this is really cool and genius. who would have even thought about this? that cool how donkeys can save the ground from wild fires. That can be useful in a lot of places.